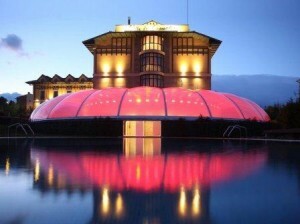 The hotel Villa de Laguardia is a 4* hotel located in Rioja Alavesa, amongst the panoramic vineyards. This hotel offers a relaxing stay in a natural and tranquil atmosphere. With a rewarding spa with wine and olive oil treatments, your stress just melts away! This Hotel has two restaurants offering a delicious range of traditional Spanish cuisine. Finally for your relaxation, the hotel has a swimming pool. Hotel Villa de Laguardia is located in the capital of the Rioja Alavesa. It is conveniently situated in an ideal environment which allows guests to explore all kinds of activities, especially those which offer gastronomic and wine routes. 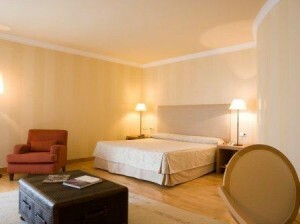 Furthermore, this hotel is very close in distance to the important Riojan wineries so guests can visit these with ease. Hotel Villa de Laguardia offers a top quality service which prioritises the comfort of their guests. The hotel has a variety of services which allow you to mix business and pleasure, with a range of meeting rooms and relaxation opportunities, this hotel is perfect for all whether it’s a business trip or a relaxing break! Facilities such as the swimming pool and spa encourage guests to unwind and let their worries float away. Guests can also enjoy a variety of traditional Riojan cuisine at the hotel’s two delightful restaurants. Hotel Villa de Laguardia embraces nature and invites you to sit outside and enjoy the sunshine with a beautifully decorated garden as well as a large terrace allowing you to enjoy the pleasant climate of Rioja. Furthermore, the hotel invites you to explore the town with its bicycle rental, which makes for a new, interesting and active way to discover Laguardia!